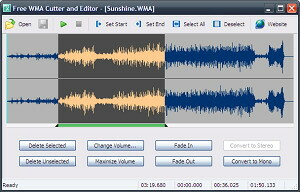 Free WMA Cutter and Editor is an extremely simple and handy Windows software for editing Windows Media Audio (WMA) files. The waveform graph and editing command buttons are then displayed. Just click on the graph to set the current position for playback, then click toolbar button or to set this position as start or end of selection. You can also click and drag on the graph to define the selection area directly. See the Editing Commands section below for short descriptions of the available commands. You can choose a new location for the file when it is being saved for the first time. Wavepad Audio Editor Free for Mac WavePad Free Audio Editor is a sound editor program for Mac OS X. This software lets you make and edit voice and other audio recordings. When editing, you can cut, copy and paste parts of recordings.